Just a few years from now, NASA expects to land a new rover mission on the red planet. The Mars 2020 mission will feature a rover which is very similar in terms of specs and appearance to its predecessor, the Curiosity rover. 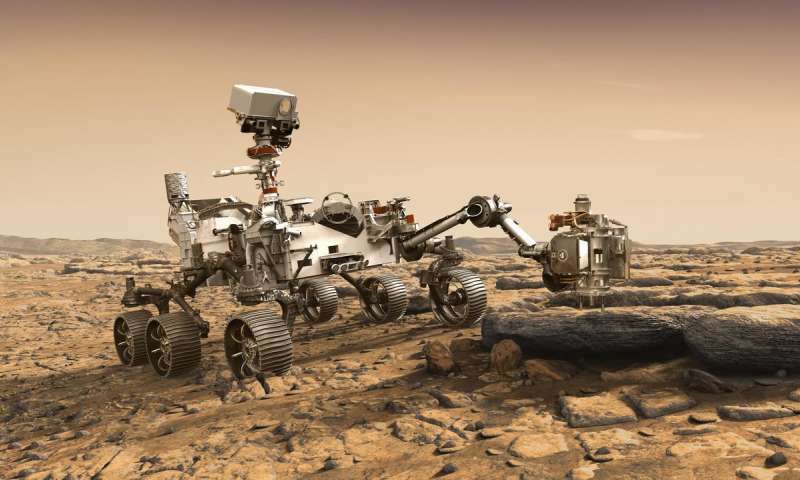 There will be some marked improvements, however, that will make landing the rover safer but also enhance its alien-life-hunting features, which is the mission’s main objective. Artist impression of NASA’s Mars 2020 rover studying a Mars rock outrcrop. Credit: Credit: NASA/JPL-Caltech. Landing a 2,000-pound science experiment on wheels more than 55 million miles away is quite the achievement in itself. In a maneuver that had never been tried before on another planet, a rocket-powered sky crane lowered Curiosity to the Martian surface on cables, then flew off and crash-landed intentionally a safe distance away. Since it first touched down on Martian soil in 2012, Curiosity has provided researchers with a trove of data and new science. Thanks to Curiosity, we now have a far clearer and accurate image of the Martian environment including its radiation levels, geology, soil chemical composition, and much more. It has beamed back high-resolution photos of ancient streambeds and drilled martian rocks on site, around Mars’ 96-mile-wide (154 kilometers) Gale Crater. Here, the rover found evidence that a nearby area known as Yellowknife Bay was part of a lake that could have supported microbial life. The upcoming Mars 2020 mission aims to further Curiosity’s legacy. Much of it will be, in fact, based on Curiosity, with about 85 percent of the new rover’s mass being based on “heritage hardware” — system designs and spare hardware employed by Curiosity. Of course, there will also be new cutting-edge tech onboard, like instruments designed to identify biosignatures on a microbial scale. A ground-penetrating radar will now be able to ‘see’ under the surface of Mars, mapping layers of rock, water, and ice up to 10 meters (30 feet) deep. The rover will also feature new imaging equipment including color cameras and a zoom lens. To top things off, a laser will vaporize rocks and soil to analyze their chemistry. For the mission, NASA plans to drill at least 20 rock cores, possibly up to 40, and return them to Earth. These samples might help answer one of the most important questions on scientists’ minds right now: Are we alone in the Universe? NASA’s Jet Propulsion Laboratory is also working on new landing tech, like terrain-relative navigation. As the descent stage carrying the 2020 rover approaches the Marian surface, instruments will compare what they ‘see’ with pre-loaded terrain maps such that the rover is guided to its landing site as safely as possible. Another related tech called the range trigger uses location and velocity to determine the optimal time to fire the spacecraft’s parachute. We don’t exactly where Mars 2020 will land but we will likely soon find out by the end of next year. In February, the potential drop sites were narrowed down from eight to three: an ancient lakebed called Jezero Crater; Northeast Syrtis, where warm waters may have chemically interacted with subsurface rocks; and possible hot springs at Columbia Hills. All of these sites are varied and very different from Gale Crater, but they all have great potential for finding signs of past or present alien life.